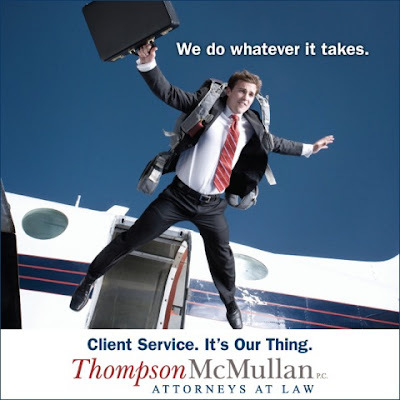 ThompsonMcMullan is an interesting Richmond, VA firm, and we’ve been looking for an opportunity to work with Amy Smith, among our favorite marketers, and one of LMA’s most-loyal leaders and volunteers. We know how clients value high-quality service. Clients have complained for decades that their lawyers don't return their calls quickly enough, or stay in sufficiently close contact. Timeliness, responsiveness, communication, caring -- it's focusing on these service-related practices that cement a relationship and build long-term client loyalty. If your firm excels at one or more of these service attributes, then broadcast it to the marketplace. Show that when they're dissatisfied with the service of their current provider, they should move to your firm. And make sure that your marketing is strong enough to be both noticed and remembered. So back to ThompsonMcMullan. Obviously highly skilled, they also happen to be an incredibly service-oriented firm. They have fewer layers, smaller dedicated client teams, and more top-level partner involvement. At TM, it’s not about the money, or increasing leverage and billing rates simply to maximize profitability. I really like these guys. Led by Managing Director Chris Malone, ThompsonMcMullan lawyers pride themselves on their personal commitment to their clients -- this is the way law used to be practiced, when the client truly came first. I think Atticus Finch would have been happy practicing law here. 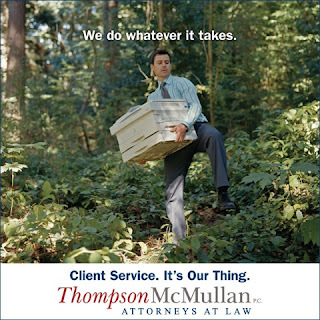 Therefore, we developed a campaign that spoke to the unique lengths they go to serve their clients, including print ads and a small firm brochure. The headline "We do whatever it takes." speaks to their commitment. And the "Client service. It's our thing." tagline casually but memorably reinforces their message. They didn't want to get locked into a developer's proprietary software, so we built an open-source WordPress website to support it. 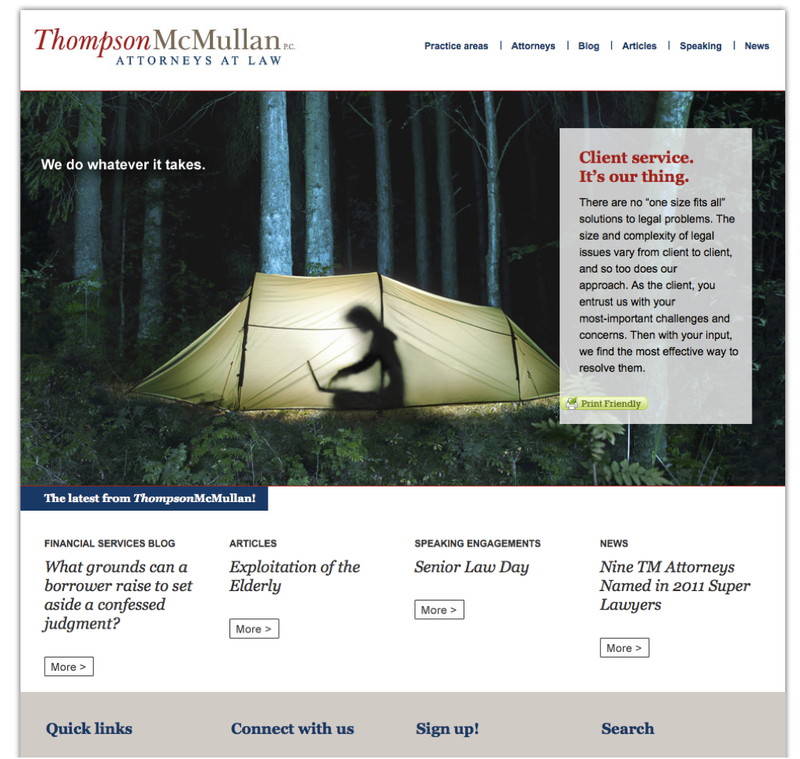 The exaggerated visuals show the lengths their lawyers go to help clients -- working in a swamp, forest, or tent; or jumping out of a plane. 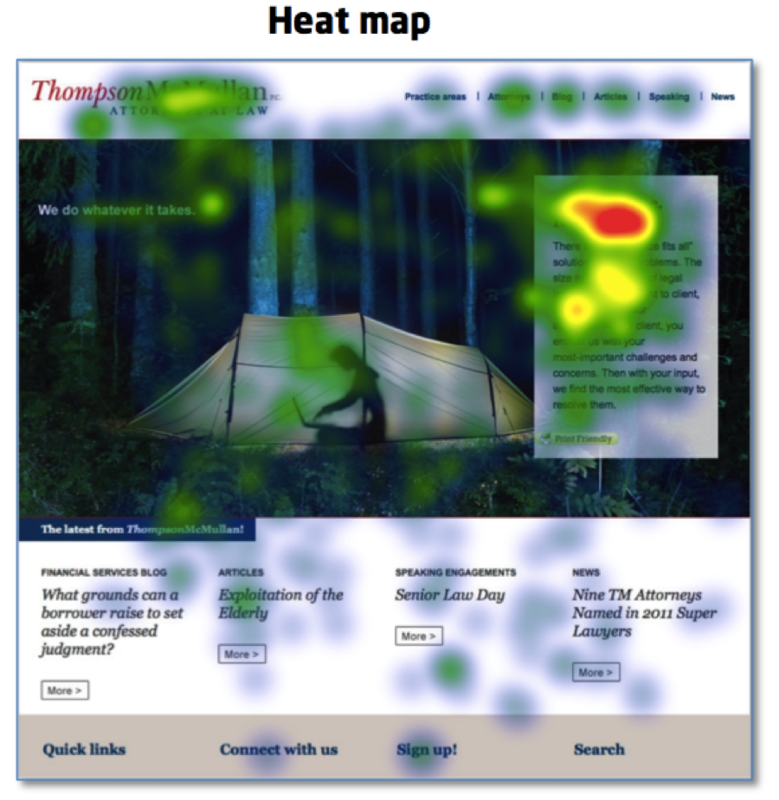 We tested the home page design using Eye-Tracking technology. We saw that visitors were reading our message, which was important, but the "We do whatever it takes" headline didn’t grab quite as much attention as we’d wanted, so we bumped up the point size. 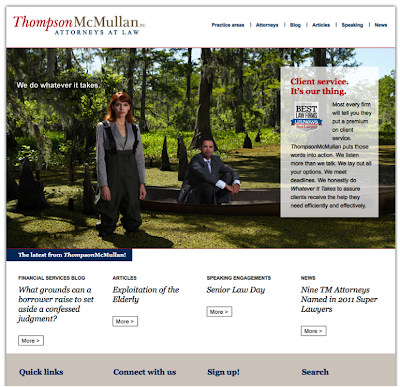 Looking for a new website, updated marketing campaign, or cutting-edge social media? Call Fishman Marketing! +1.847.432.3546 or ross@fishmanmarketing.com.